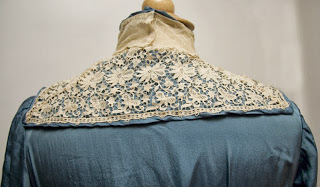 BLUE SILK & LACE TITANIC 1912 EDWARDIAN DRESS, FINE CONDITION! Wearable size and condition for those who want to actually wear garments for events and re-enactments. Wow! What a stunning dress -- lovely styling! This Titanic Era, 1912 dress is sure to be a head-turner wherever it makes an appearance! 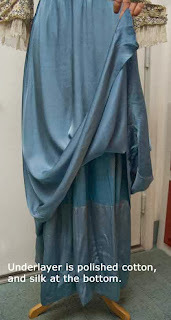 The blue on this dress is a rich blue, nearly to turquoise in hue, a warm sky blue I would call it. The dress has three kinds of lace, I think the beautiful open work lace is called Alencon, (on collar and sleeves) and there is also fine netted lace in the high neck and chest area. 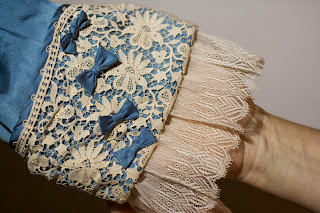 The third kind of lace is also a silk fine lace with a zig zag edging, gathered along the bottom of each sleeve. Note the darling set of 6 blue silk bows coming down the front of the bodice and there is a set of 4 such bows on each lovely sleeve. 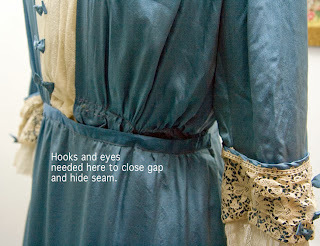 The overlayer of silk in the skirt area comes down to a point in the center front, and a softer point in center back. Layers in the skirt are a definite style point signaling the year,1912. I have taken photos of every area of the dress, so you can see all the details. Here are the measurements, and please note these are ACTUAL measurements done with a tape measure around the mannequin body, (not laid flat and then doubled, as most ebayers measure). These measurements are not guaranteed to be absolutely precise, but are taken softly while the dress is on the body, so you may know these are meaningful, bankable measurements. They cannot be LESS than I am stating here. I would say that this dress, therefore, is a Size 8. The armpits are in clean, non-stained condition. To fasten the dress, it has hooks and eyes going from the center high neck in back, down the left shoulder and under left side of the collar area, to the waist area. (When I say left -- I mean while wearing the dress) Note that I have photographed that one hook and eye should be put on to make the waistband sit right and not show the under seam, as seen in the photo (under the left breast area). There is no label inside this dress. 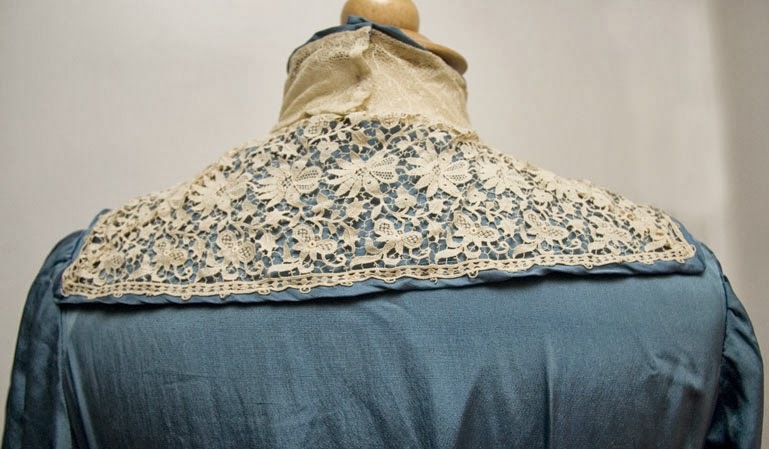 As with the majority of ladies' dresses at this time in history, clothing was made for the woman specifically, by a seamstress, not store-bought. Flaws: I have taken photos of the very slight flaws. There are a few light tan stains on the back of the dress, on the left. 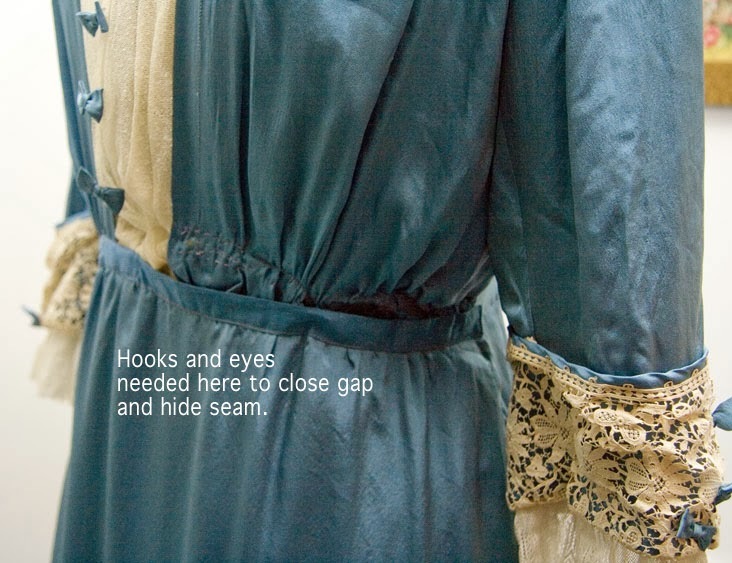 There is a tiny tear and discoloration at the front right shoulder seam area, but covered by the fullness of the bodice, as it does softly gather in that area, over the seam. There is an abrasion to the silk in front, around the thigh area (note between my fingertips) There is a tiny hole in the silk underlayer right beneath the upper layer, which I didn't photograph, didn't notice it until now. All these flaws are minimal, they will not be noticeable when being worn, I mention them for accuracy. 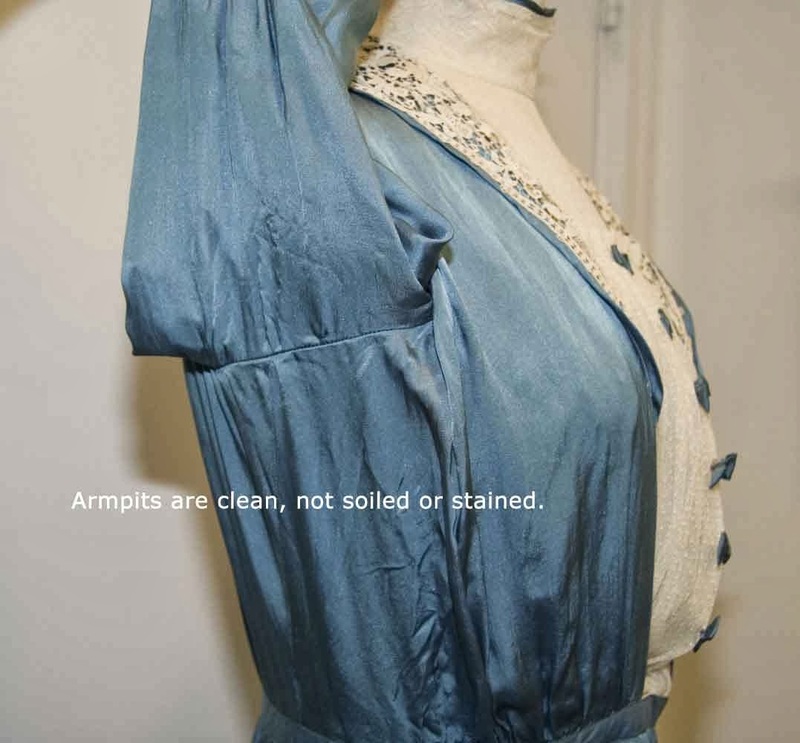 As you probably know, Edwardian dresses are considered RARE. At the time of James Cameron's making of Titanic in 1996, their wardrobe head swept the country clean of all 1912 era clothing. They called me too, asking if I had any; they called every dealer in vintage clothing all across the country. Sad to say, while this era clothing was already in short supply, because the styles changed rapidly at WW1 time, they really made it extremely rare. All those garments were either destroyed by being worn in the movie, being taken apart and remade by the wardrobe dept., or are hanging rotting on hangers in a warehouse, that is the sad final outcome of such a precious commodity. It is unfortunate they swept up all the 1912 clothing they could find, both women's and men's, making genuine garments truly difficult to find. I can state this as fact, because I've been a dealer in vintage for 27 years, and a collector of specifically 1912 garments for 30 years, which I wear to the Somewhere in Time Weekends at Grand Hotel, the annual events that celebrate the cult classic movie starring Christopher Reeve and Jane Seymour...considered by its fans to be The Most Romantic Love Story Ever Filmed. Fans of this movie believe Cameron stole his entire love story from Somewhere in Time, as the key elements from SIT are all there...but that is another story, and to be found on the Somewhere in Time Website (Articles section). Probably about 1914 or so.